A border wall or fence is a barrier constructed along an international border to prevent illegal immigration and protect a nation's security. Conservatives and nationalists generally support border walls, along with increased general border security, while liberals and globalists generally oppose border walls and support replacing them with open borders. The number of border walls has been increasing around the world, and the number being built is accelerating. By 2017, over 60 (and according to some sources, nearly or over 70) border walls existed around the world. None of the barriers currently in operation existed before 1945, and their number slowly grew until the September 11, 2001 attacks, after which the rate of wall building greatly accelerated. Countries build border walls to increase security, prevent violence, and stop illegal border crossings, and they have been effective. The Great Wall of China is 5,500 miles (8,850 km) long. The first parts of the wall were constructed in the 600s B.C., but Emperor Qin Shi Huang is remembered for his role in building and expanding the wall. The wall was repaired and expanded through the Ming Dynasty in the late Middle Ages and Early Modern Period. The purpose of the wall was to protect China from the Mongolians in the north. A limes, pronounced lee-mez, from which we get modern English limits, were barrier walls delineating the limits of the Roman Empire. On the outside of the limes were the barbarian hordes who wanted access to the more affluent civilization to either plunder its wealth or learn their technology, but refused to submit to Roman law or adopt Romanized customs. Hadrian's Wall is in the north of England, running 73 miles (118 km) from coast-to-coast. The wall was constructed after the Roman Emperor Hadrian visited Britannica in 122 A.D., and construction lasted six years. Historians debate the exact purpose of the wall, but it was probably intended to separate the Romans from the barbarians and to defend Britain's northern border from the latter. Historians debate the effectiveness of the wall, but it is often viewed as being a tactical success and the most effective Roman barrier in Britain. Israel has built several effective border barriers along its borders, and it has used those barriers to fight against illegal immigration. In January 2013, Israel completed most of its fence along its border with Egypt, which it built due to massive levels of illegal immigration from Africa which caused a proportionate increase in crime. The Israeli government reported later that year that illegal immigration into Israel had dropped by over 99.9%. The Israeli government reported in September 2017 that zero people had entered the country illegally from Egypt in the past 12 months. In May 2018, Israel began construction of an underwater border wall along its border with Gaza. The media noted the effectiveness of the barrier. In February 2019, Prime Minister Netanyahu announced that Israel had begun construction of a new barrier along the border with Gaza. In addition, Israel's fence along the West Bank has also been effective, greatly lowering suicide and other terrorist attacks. Israeli Prime Minister Benjamin Netanyahu has strongly supported his nation's border barriers. The Trump Administration has viewed Israel's border barriers as a model for its own proposals, and Hungary's conservative government has done the same. Hungary was overrun in 2015 by refugees passing through the country. In response, conservative Prime Minister Viktor Orbán took several actions, including building a border barrier along the border with Serbia and Croatia. The fence was so effective that illegal immigration levels dropped to levels seen before the crisis began, and by September 2017, illegal immigration levels had dropped by 99% since 2015. In April 2017, the Hungarian government completed construction of a second border fence, one with high-tech features, on the Serbian border. Unlike most other European countries, Hungary's leadership has taken a more conservative right-wing, common sense approach to the immigration crisis. As Orbán himself noted, Hungary's policies likely saved all of Europe from an even greater and more catastrophic migrant crisis. Liberals and globalists, on the other hand, attacked Hungary for its actions. Orbán won a supermajority in parliament in 2018 after making fighting mass migration his party's main campaign theme. As of 2017, about a third of the United States border with Mexico has a border barrier constructed along it. About 80% of that border wall was constructed due to the Secure Fence Act of 2006 (Pub.L. 109–367). Illegal immigration levels decreased in the areas where the wall was built. Among other examples, in Yuma, Arizona, illegal immigration levels fell by 82% between 2007, when the fence was first built, and 2017. Additionally, these border barriers are so effective that they have redirected the flow of illegal migration into very remote and dangerous areas where walls do not exist – illegal immigrants would rather risk their lives crossing there rather than even try to deal with border security. Donald Trump, who was elected U.S. President in 2016, promised to complete and build a wall along the United States–Mexico border in order to halt the flow of illegal immigration and slow the illegal import of drugs, firearms, and other materials. In 2016, the Republican Party Platform began calling for construction of the Border Wall. While liberals and establishment Republicans complain that building the wall will cost too much money, the Trump Administration's January 2018 proposal of spending $18 billion to construct a wall would comprise only 0.0338% of the federal budget. 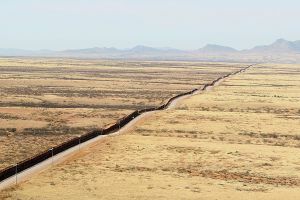 A 2018 report from the Center for Immigration Studies found that the cost of a border wall is less than the cost of illegal immigration. It also would be less expensive than a DACA amnesty. ↑ 1.0 1.1 More neighbours make more fences. The Economist. January 7, 2016. Retrieved August 26, 2017. ↑ 2.0 2.1 2.2 2.3 2.4 Greaves, Simon; Faunce, Liz (March 26, 2017). Rise of the border wall shows there is more that divides us. Financial Times. Retrieved August 26, 2017. ↑ 3.0 3.1 3.2 Samuel Granados, Samuel; Murphy, Zoeann; Schaul, Kevin; Faiola, Anthony (October 12, 2016). Raising Barriers: A New Age of Walls · Episode 1. The Washington Post. Retrieved August 26, 2017. ↑ Rubin, Michael (January 23, 2018). Trump's border wall is standard practice in other parts of the world. Washington Examiner. Retrieved January 23, 2018. Binder, John (January 14, 2019). PHOTOS: From Vatican Walls to Obama’s Fence, 20 Barriers Around the World. Breitbart News. Retrieved January 15, 2019. ↑ Kirkwood, R. Cort (January 17, 2019). Trump Right: Wall Building Is Big Business. Why? They Work. The New American. Retrieved January 17, 2019. ↑ Binder, John (January 17, 2019). PHOTOS: Bulgaria, Australia, Slovenia Prove Border Walls Stop Illegal Immigration. Breitbart News. Retrieved January 18, 2019. ↑ Arthur, Andrew R. (January 19, 2019). Enough with the 'Either-Or' Wall Arguments. Center for Immigration Studies. Retrieved January 20, 2019. ↑ 12.0 12.1 12.2 Shaw, Adam (February 1, 2019). As Trump makes border wall pitch, other countries say theirs work. Fox News. Retrieved February 1, 2019. ↑ 13.0 13.1 13.2 13.3 Great Wall of China. Encyclopædia Britannica. Retrieved August 26, 2017. ↑ 14.0 14.1 14.2 Breeze, David J. Hadrian’s Wall. Encyclopædia Britannica. Retrieved August 26, 2017. ↑ 15.0 15.1 15.2 Mark, Joshua J. (November 15, 2012). Hadrian's Wall. Ancient History Encyclopedia. Retrieved September 8, 2017. ↑ Wacher, John (June 17, 2014). The Coming of Rome. Routledge Revivals. Pg. 63. ISBN: 9781317754039. ↑ Kassam, Raheem (September 7, 2016). Walls Around The World That Work: Britain Is The Latest Country Bolstering Its Borders. Breitbart News. Retrieved August 26, 2017. Mason, Ian (May 14, 2018). Exclusive — Ted Cruz: Israel Is ‘Undoubtedly’ a Model for Securing Our Borders. Breitbart News. Retrieved May 15, 2018. Danan, Deborah (December 12, 2018). Trump Hails Israel’s Wall as Model for U.S.-Mexico Border. Breitbart News. Retrieved December 12, 2018. ↑ Israel completes bulk of Egypt border fence. Reuters. January 2, 2013. Retrieved August 26, 2017. ↑ Glick, Caroline (February 1, 2018). Caroline Glick: Israel Built a ‘Wall’ and Is Deporting Illegal Aliens. America Can Learn. Breitbart News. Retrieved February 1, 2018. Cohen, Shimon; Dvorin, Tova (January 1, 2014). Data: Infiltrators Cause Crime Rates to Skyrocket in Tel Aviv. Arutz Sheva. Retrieved February 1, 2018. Danan, Deborah (March 21, 2018). Netanyahu Says Wall Prevents ‘Flood’ of Illegal African Migrants. Breitbart News. Retrieved March 21, 2018. ↑ Schwartz, Sharona (November 11, 2013). Does a Border Fence Work? Check Out the Dramatic Change After Israel Put One Up. The Blaze. Retrieved August 26, 2017. ↑ Pollak, Joel B. (June 4, 2013). Israel Builds Sinai Border Fence; Illegal Crossings Drop 99.9%. Breitbart News. Retrieved August 26, 2017. ↑ Danan, Deborah (September 20, 2017). Israel’s Southern Border Fence 100 Percent Effective in Preventing Illegals from Infiltrating. Breitbart News. Retrieved September 20, 2017. ↑ Pollak, Joel B. (May 27, 2018). Israeli Builds ‘Border’ Wall near Gaza — Underwater. Breitbart News. Retrieved May 27, 2018. Ahronheim, Anna (August 5, 2018). Israel Releases First Pictures of Underwater Barrier with Gaza. The Jerusalem Post. Retrieved December 12, 2018. ↑ Israel’s Security Barrier with Egypt Still Success Story Six Years Later. Breitbart News (from JNS). January 13, 2019. Retrieved January 13, 2019. Danan, Deborah (February 3, 2019). Netanyahu: Construction on New Gaza Border Barrier Has Begun. Breitbart News. Retrieved February 3, 2019. Byas, Steve (February 4, 2019). Israel Adds To Its Security — With Massive New Border Barrier. The New American. Retrieved February 4, 2019. Israel starts building massive fence on Gaza border. Associated Press. February 3, 2019. Retrieved March 22, 2019. ↑ Mitchell Bard. West Bank Security Fence: Background & Overview. Jewish Virtual Library. Retrieved August 26, 2017. ↑ Klukowski, Ken (October 20, 2015). Israel’s Security Fence Saves Lives, Builder Tells America. Breitbart News. Retrieved August 26, 2017. ↑ Klein, Aaron (February 9, 2016). Netanyahu Goes Full Trump: Surround Israel With Barrier ‘To Defend Ourselves Against Wild Beasts’. Breitbart News. Retrieved August 26, 2017. ↑ Danan, Deborah (June 13, 2018). DHS Secretary Kirstjen Nielsen Tours Israel Border Barrier for Mexico Wall Ideas. Breitbart News. Retrieved June 13, 2018. ↑ Pfeffer, Anshel (July 17, 2018). Orbán Is Coming to Israel to Meet His Soulmate Netanyahu. Here’s How He’s Taking Down Hungary’s Democracy. Haaretz. Retrieved July 18, 2018. ↑ Savitsky, Shane (February 1, 2017). Border fences and refugee bans: Hungary did it — fast. Axios. Retrieved October 6, 2017. Kent, Simon (September 15, 2015). End Of The Line: Hungary Seals Borders As Migrant Flow Surges On. Breitbart News. Retrieved August 13, 2017. Hungary Seals Border, Detains Thousands, Threatens To Imprison Illegals. Breitbart News (from AFP). September 15, 2015. Retrieved August 13, 2017. Successful Hungarian Border Fence Boosts Support Of Right Wing Government. Breitbart (from Reuters). September 19, 2016. Retrieved January 29, 2017. ↑ Hungary Closes Border With Croatia. Voice of America. October 16, 2015. Retrieved August 13, 2017. ↑ Lane, Oliver JJ (October 29, 2015). Hungarian Border Fence So Effective Illegal Immigrants Are Now At Pre Migrant-Crisis Levels. Breitbart. Retrieved January 29, 2017. ↑ Montgomery, Jack (September 15, 2017). Hungary Builds a Wall, Cuts Illegal Immigration by Over 99 Per Cent. Breitbart News. Retrieved September 16, 2017. Montgomery, Jack (February 9, 2019). EXCLUSIVE – Hungary Backs Trump’s Wall: ‘Border Protection An Obligation of the State’. Breitbart News. Retrieved February 9, 2019. Montgomery, Jack (February 15, 2019). Hungary: ‘Fighting Illegal Migration Not Possible Without Physical Barriers at Border’. Breitbart News. Retrieved February 15, 2019. Hungary Completes Second Anti-Migrant Fence. Breitbart News. April 28, 2017. Retrieved April 28, 2017. Hungary completes 2nd border fence meant to stop migrants. Fox News (from the Associated Press). April 28, 2017. Retrieved August 13, 2017. Hungary completes second fence to keep out migrants. Deutsche Welle. April 28, 2017. Retrieved August 13, 2017. ↑ Shaw, Adam (March 1, 2017). Europe's pro-Trump outpost: Populist Hungary buoyed by US shift on refugees, Russia. Fox News. Retrieved March 1, 2017. Bensman, Todd (April 3, 2019). Progress Report from Hungary's Fenced Borderlands. Center for Immigration Studies. Retrieved April 6, 2019. ↑ Montgomery, Jack (April 4, 2017). Orban: ‘Hypocrisy’ Prevents Europe from Admitting Gratitude to Hungary for Halting Migrant Influx. Breitbart News. Retrieved April 4, 2017. ↑ Williams, Thomas D. (September 13, 2017). Hungary Takes NY Times to School on Europe’s Migrant Crisis. Breitbart News. Retrieved September 13, 2017. ↑ 109th Congress Public Law 367. GPO. Retrieved August 26, 2017. Binder, John (December 17, 2018). Democrats Funded ‘Wall’ Under Bush, Obama–Refuse Same Barrier to Trump. Breitbart News. Retrieved December 17, 2018. ↑ Binder, John (August 24, 2017). DHS: Arizona Proves ‘Border Walls Work’. Breitbart News. Retrieved August 26, 2017. ↑ Binder, John (February 5, 2019). Fact Check: Stacey Abrams Is Incorrect, Wall Proven Effective at Border. Breitbart News. Retrieved February 6, 2019. ↑ Dan Crenshaw, Twitter. February 12, 2019. Retrieved February 14, 2019. ↑ Trump stops in Arizona border town where illegal immigration plunged 82%. Fox Business. August 22, 2017. Retrieved September 9, 2017. ↑ Duke, Elaine (August 22, 2017). Homeland Security secretary: Border walls work. Yuma sector proves it. USA Today. Retrieved March 30, 2018. ↑ Mehlman, Ira (March 1, 2019). NPR Accidentally Admits Border Fences Are Effective. ImmigrationReform.com. Retrieved March 18, 2019. ↑ Harper, Jennifer (January 10, 2018). Reality check: Cost of Trump’s border wall is 0.0338 percent of federal spending, says new analysis. The Washington Times. Retrieved January 10, 2018. Jeffrey, Terence P. (November 30, 2018). Trump’s $5B Border Wall Request Equals 0.11% of Federal Spending. CNS News. Retrieved November 30, 2018. ↑ Byas, Steve (October 9, 2018). Cost of Border Wall Less Than Cost of Illegal Immigration. The New American. Retrieved October 9, 2018. ↑ Bedard, Paul (October 9, 2018). Shock report: US paying more for illegal immigrant births than Trump’s wall. Washington Examiner. Retrieved October 9, 2018. This page was last modified on 9 April 2019, at 00:44.